With the recent and major Gohta discovery, the interest has grown in the oil and gas potential of the upper Palaeozoic carbonates as both source and reservoir rocks in the Barents Sea. 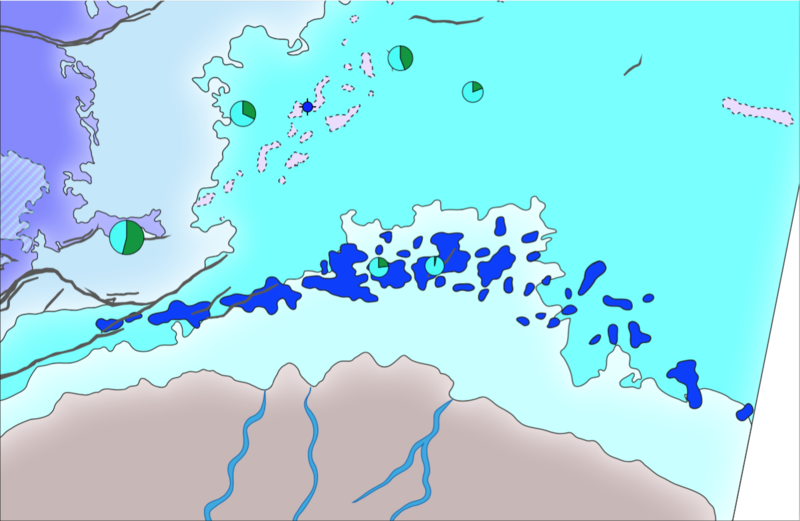 The Barents Sea – North Greenland – Svalbard area was characterized by the development of two linked rift systems during the Late Palaeozoic, and deposition took place in a complex of rapidly subsiding basins ( Tromsø, Nordkapp and Sørkapp basins, Fingerdjupet, Maud, Tiddlybanken Basins) and more stable platforms (Fig. 1). 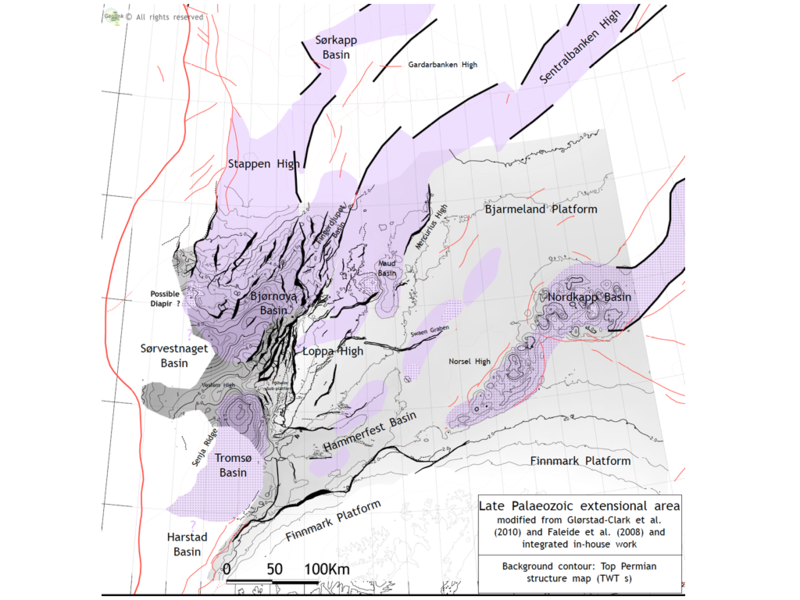 The Upper Palaeozoic succession counts 4 lithostratigraphic Groups (the Billefjorden Group, the Gipsdalen Group, the Bjarmeland Group and the Tempelfjorden Group) bounded by major unconformity surfaces that reflect significant changes in climate, sea-level and tectonic regime. Climate was an important controlling factor on sedimentation regimes; the region apparently passed from the humid tropical zone in the early Carboniferous, through the arid zone in the mid-Carboniferous to Early Permian, before entering more temperate conditions in the mid-Permian. 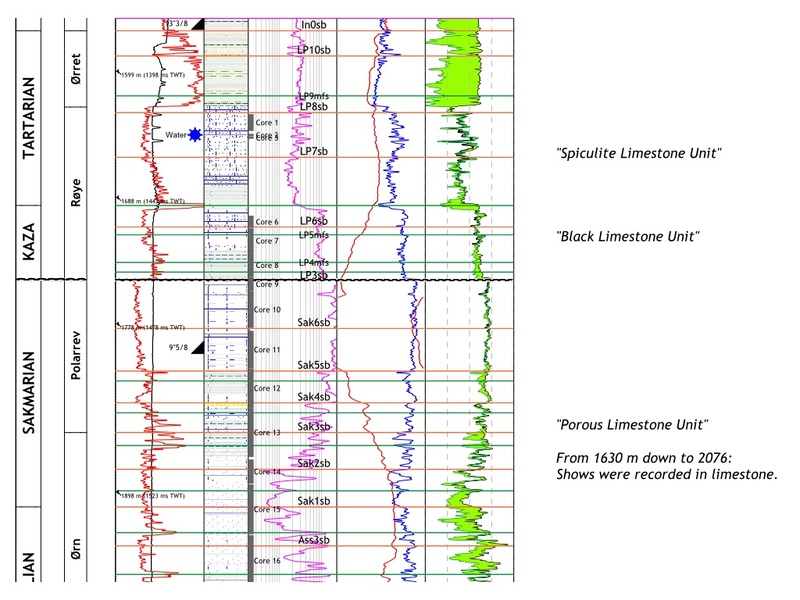 These carbonate platforms also sustained subaerial exposure and karstification at different periods, strongly enhancing the reservoir potential of these carbonates. The Paleozoic interval accounts also for potential source rocks, proven in the Upper Permian limestone of the Tempelfjorden Group and in the Lower Carboniferous coals of the Soldogg Formation from well 7128/6-1. 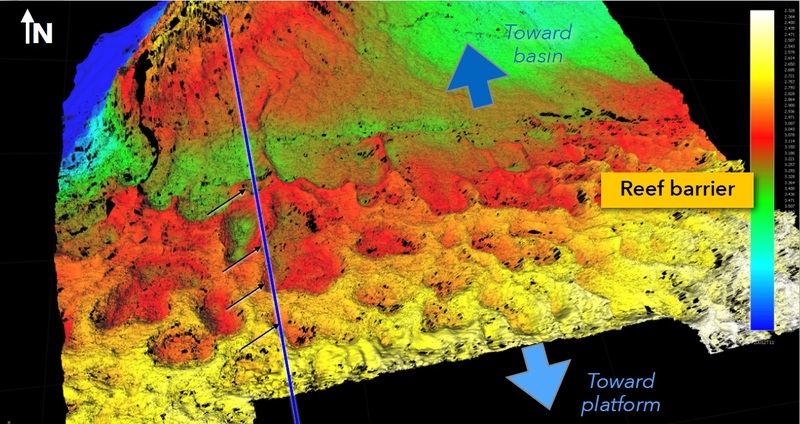 The main goal of the study is to better constrain the pattern of depositional environments by mapping through time the distribution of the successive warm- and cool-water carbonate platform environments and lateral basinal facies. As several major tectonically-induced unconformity surfaces develop throughout the Palaeozoic interval, the structural setting of the Palaeozoic basins will be established and mapped as well, from the Early Carboniferous to the latest Permian. Several local horizons have been mapped as well, to better understand facies development, like lagoons (Fig. 4) and the interfingering of carbonate deposits and siliciclastic sediments of the Røye and Ørret Formations respectively. Thanks to the Paleozoic regional maps and the detailed stratigraphic interpretation of wells, 3 paleogeographical maps can be drawn for the Gipsdalen, Bjarmeland and Tempelfjorden Groups (Fig. 5). In addition, these maps also include N/G and Net sand information.